With the constant endorsement of our diligent experts, we are engrossed in presenting a highly qualitative Dough Divider. to the industry. Specifications: Capacity 1600 pieces P/H of 200 gms to 1000 gms Motor 3 H/P 440/220 Volts Net Weight 1000 Kg Gross Weight 1300 kg Dimensions 78 1/2" Width, 65"
- Weight: 4 Gms. – 100 Gms. Adjustable. Weight Accuracy One Gram. We are a prominent organization, engaged in offering supreme grade Dough Divider. These products are widely demanded by our clients for their sturdy construction and longer lasting service. Our team of quality professionals make these machines by making use of premium grade materials and components. - It is helpful to save your energy and time. - Twin shaft leads the cutters to divide dough as ease. - 4 wheel design is convenient to moving. - Interlock Switch is standard to protect operator. - Dough ball divider and rounder. - Reasonable design, uniform and complete dividing. - Manual dividing, easy to operate, even rounding for buns. 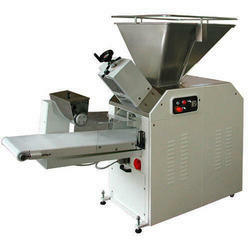 A broad range of Dough Divider machines is offered by us, which is suitable for making all types of dough. These equipment are installed with two standard dividing pistons. Based on cutting edge technology, the dough hopper of this machine can be filled either manually or with lifting & tilling device depending on output. - Most suitable for chapatti manufacturing units also can be used for other purposes also.